Going to place surrounded by water on all sides and not tasting the saltiness of seawater is completely unacceptable! North Bay is one of the most highly visited islands in Andaman and is around 42 km from Port Blair. Also, if you’re a bit of a curiosity cat, we’ll spill the beans and let you in on a secret – the image on our everyday (well, the old one) Rs. 20 note is taken from here! If you get to the top of a hill, overlooking the lighthouse on North Bay island, you can actually recreate the Rs. 20 note image. Now, how cool is that? 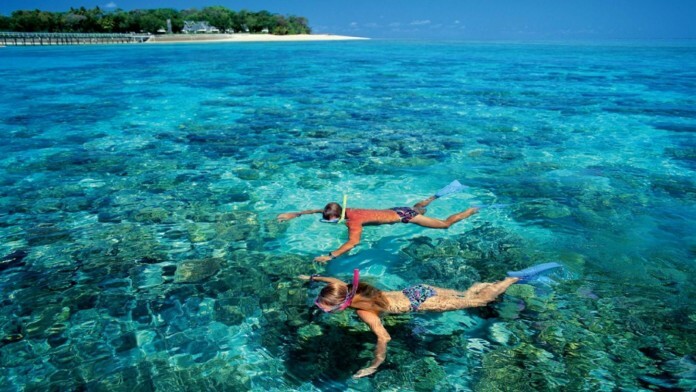 If you are planning to go snorkeling, there are a few things you ought to know. For starters, you don’t entirely need to know how to swim. Snorkeling is totally different from Scuba-diving and you’ll barely be underwater. The whole mechanism is built in such a way that you don’t tread into Deepwater. So, you can only swim with fishes that live really close to the shore. If you completely despise anything related to dipping your feet in water, get on these special boats and you’ll be set for the rest of your trip! Glass-bottom boats are a gift from God, making everything so much easier. You can now view all of the marine life living underwater through a glass window! The boat controllers usually switch off the engine when they reach the habitat in order to stop the fishes from swimming away! Imagine looking at your feet and seeing a school of fish minding their own business like it was a usual day? Totally worth it! Havelock Island at Andaman is easily one of the most beautiful islands there is. The white sand, clear sky and shimmering seawater will make you feel nostalgic. It’s weird because if you’ve never been to Andaman before, you’d still feel it! The serenity at Havelock is something that you can’t find anywhere. Of all the beaches in this island, head to Radhanagar and then Elephant beach for it’s unmatchable beauty is something you’ll remember for a long time! If you’re not a beach person (ok, why are you reading this article), rent a bicycle and go around the periphery of the beach during sunset, and thank us later! You will have to take a boat to Ross Island in the morning and get back to the mainland with the ferry that waits for people to head back. From afar, it seems like this island has been abandoned and has no life but it actually does! This island was a base for Britishers back during the war era and you’ll be able to see the effect of war on this island soon enough. The old and dilapidated buildings, bakeries and barracks have beautifully mingled with its environment. You’ll definitely be surprised to spot a few deers and peacocks wandering around the island without the fear of humans or predators! Go put your photography skills to test! Well, it’s not everyday you get to visit a jail, let alone a jail called ‘Kala Pani’ that has been referred to in so many Bollywood films! Everyday, usually around sunset, they host a sound and light show depicting the lives of prisoners back in the day. It’s like actually being there to witness a real situation! So, if you’re around this place, stick around till sunset or arrive in a way that you see the entire place and make it in time for this spectacular show! If you’re not an adventure seeker, this might ask of you a lot! Crossing mangroves by a boat that can take 5 people at a time, trekking along a wet and muddy path and reaching the caves is a herculean task indeed! But, fear not! There is a refreshment stop along the way to quench your thirst and hunger. Be sure to wear good sports shoes with a good grip because if it rains (extra tip: carry an umbrella at all times because it rains like nuts in Andaman), you’ll be faced with a path that’s more slippery than ever! The best part about getting to the limestone cave is the boat ride – you will actually feel like you’re acting in the Hollywood film, Anaconda! Those mangroves are truly a sight to sore eyes! Chidiya Tapu is a paradise for bird photographers and wildlife observers in general. It would take you around an hour to reach this place if you’re stationed at Port Blair. The sunsets at Tapu look like they’ve been photoshopped in real life! So, don’t forget your cameras but you’re better off without them – enjoy the serenity in the moment. It’s truly worth it. If you get lucky, you can spot parakeets, sea eagles and many more birds! To reach this place, you can either opt for bike rentals or hop on to a public bus. But let us tell you a secret, though there are several bike rental services in India which are stationed in a number of major cities, which you might have hired for some adventure trip, but if you are in Andaman and not hiring these bikes, then you are missing all the best things of your Andaman trip. So, if you are looking for renting a bike in Andaman, then don’t forget to carry your Driving License first. The 2 wheelers are available at Port Blair. Most of the vendors are present at Aberdeen Bazaar, around 3 km from the airport and there are some vendors who will hand you over the bike at your Hotel if you place a booking request online. I was there at the spectacular and dramatic sound and light show and it was amazing. As this place holds a lot of historical stories you must visit it once for the amazing show, it will definitely give you goosebumps if you have any interest in our India’s history.